False! Pope John Paul II was very much a supporter of Medjugorje (although unofficially, which he had to be because Medjugorje was not yet approved). Read more: I heard the Pope is against Medjugorje. My favorite comeback to this is one I heard many years ago from one of the local guides, and it is: "Then satan has converted!". Scripture tells us that you will know by their fruits. And the fruits of Medjugorje are amazing. Over 30 million people have visited Medjugorje since the apparitions began in 1981. Read more: I heard that the apparitions in Medjugorje are the work of satan. Read more: What is the message or purpose of Medjugorje? Absolutely Not! 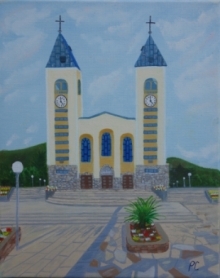 Medjugorje is not just for Catholics. God loves all His people. Many people who come on our trips are not Catholic and come from many different faiths and religions throughout the world. Read more: Is Medjugorje just for Catholics? Read more: Are these the last apparitions on earth?